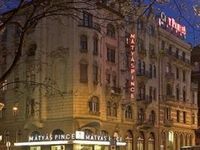 The City Hotel Mátyás is located in the heart of the beautiful Hungarian capital, Budapest, on the Pest side of the city near the Danube at Elisabeth Bridge. The most famous street of the city, the busy, pedestrian Váci utca, with is most exclusive shops and restaurants, is in the vicinity and can be reached with a 5-minute walk. Thanks to its perfect location the hotel is a good base for discovering the city, either on foot or by means of the excellent public transport network. If you feel like choosing an extraordinary way of sightseeing, try a day- or night-river cruise from the nearest port (400 metres) or get on tram no. 2 next to the hotel and travel along the river while enjoying the breathtaking view of Buda and Pest with the Castle and the Parliament. The monument building hotel has 85 modern rooms, 46 twins, 21 doubles, 9 triples, 3 singles and 6 apartments on 5 floors. Some of them offer a fascinating panoramic view onto River Danube and Buda Castle. All rooms are comfortably equipped with SAT TV, telephone, radio, refrigerator, work desk. All of the bathrooms are with shower (except 2 with bathtub) and hair dryers are available on request. The 24-hour reception, the wake-up service, the internet corner in the lobby, the elevator, the safe at the reception and the luggage room make the guests' stay more comfortable. The quality services, the well-equipped rooms and the friendly staff ensure a pleasant vacation for individual guests and groups arriving on both business and leisure. In case of reservations for 1 person, Double or Twin rooms are not guaranteed. Restaurant Mátyás Pince: Mátyás Pince (Matthias Cellar) Restaurant, renowned far and wide for its historical interior and superb cuisine is positioned beneath the hotel. This traditional restaurant was founded in 1904 and named after the great Hungarian Renaissance ruler, Matthias. 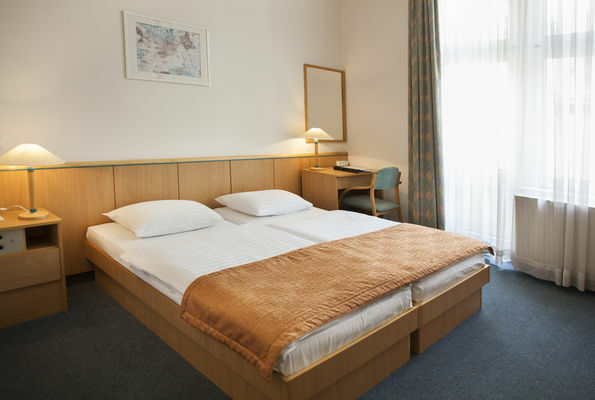 Its 5 spacious, air conditioned rooms offers a capacity for maximum 300 people. The beautiful stained glass windows and frescoes, the waiters in periodical costumes and the delicious meals make your visit here unforgettable. Our rich buffet breakfast is served here as well as lunch or dinner if required. Half board: Half board for groups can be provided in Matthias Cellar Restaurant by prior arrangement.